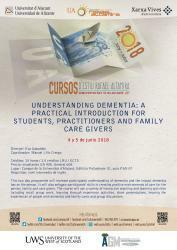 This two day programme will increase participants understanding of dementia and the impact dementia has on the person. It will also enhance participants' skills in creating positive environments of care for the person, family and care givers. The course will use a variety of interactive teaching and learning activities including small group work, learning through experience activities, short presentations, hearing the experiences of people with dementia and family cares and group discussions. Each session will consist on: an introduction to the theory, activities which demonstrate the theory, small group, then large group discussion of what was learned in the activity (debrief from the activity), discussions on real-life application and finish with asking what the learners will do next. Attendees will record their thinking in the Care Empathia booklet. Si el nombre d'alumnes matriculats en el curs no supera el mínim establit la Universitat d'Alacant pot resoldre la no celebració del mateix.